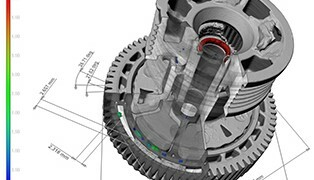 Inspection using CT Scanning and X-Ray to validate internal geometry and functionality are key requirements for engineered components with complex designs or structural elements. 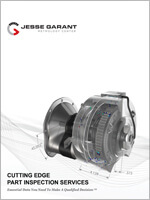 Jesse Garant Metrology Center understands that engineered products require specialized inspection to ensure tight tolerances and strict quality standards are met. As a trusted nondestructive testing lab, we continue to utilize the latest imaging technology to meet the inspection challenges of our customers in advanced manufacturing. We’re equipped with a full suite of advanced imaging options, providing critical NDT and metrology data for all stages of manufacturing, from design to quality control. We have the greatest diversity of industrial computed tomography systems in North America, including a high-energy CT system for rapid testing of parts up to 44.5” in diameter by 63” in height. For even more imaging options, we also offer radiographic testing and external 3D scanning services. We’ve conducted inspections of a wide range of engineered products and components for various applications in aerospace, oil and gas, defense, and automotive industries. Our NDT systems inspect complex parts and assemblies of a variety of sizes, shapes, and materials including: valves, connectors, fittings, castings, assemblies, polymer bearings with sensors, welded parts, brazed assemblies, additively manufactured components, alloy or composite piping, intricate heat transfer devices, and micro part components. Nondestructive testing during pre-production plays an integral role to ensure engineered products will be manufactured to consistent quality standards. Our industrial CT services identify defects and validate fit and function of first run parts and assemblies without destructive testing. We also obtain precise and accurate data for qualifying complex dimensions for satisfying First Article Inspection (FAI) requirements. Industrial CT gives valuable feedback for monitoring the often complex production processes of engineered components. Nondestructive testing with CT at specified intervals can qualify parts before reaching their destination, ensuring that manufacturing processes are working as intended. CT also provides full validation of high value, limited run assemblies. Our NDT services take the guesswork out of quarantined, warranty or recalled engineered products, providing a traceable and repeatable inspection process customized to client needs. With industrial CT, we provide definitive, highly detailed data for isolating suspect parts within otherwise good lots. Industrial x-ray is another viable option for larger part volumes. Industrial computed tomography is the ideal tool for conducting failure analyses of complex engineered products. CT preserves original failure conditions while identifying and modelling virtually all types of external and internal defects, including: assembly misalignments, inconsistent wall structures, porosity, voids, and cracks, and internal inspection of fibers to highlight areas prone to weakness.